What a steal of a deal to watch at Dodger Baseball game. 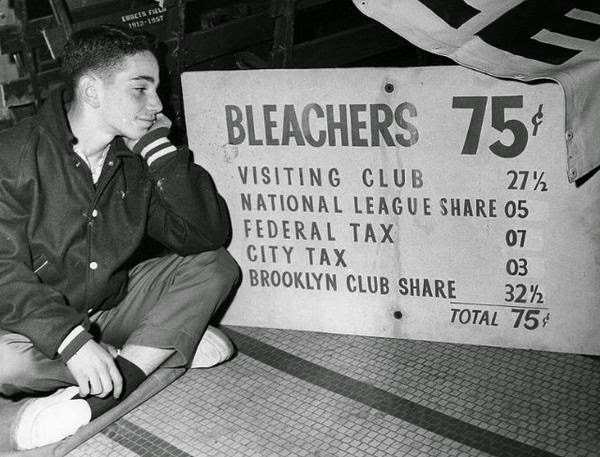 Featured above is a circa 1950's vintage photo showing the cost of a game at Ebbets Field, via @Dodger_History on twitter. Via Steve Dilbeck at the LA Times, "In defense of Dodgers General Manager Ned Colletti." We find out that the big-3 prospects weren't the only untouchables in the system. Sometimes things happen you have no control over. By the trading deadline, Colletti knew what was up with the bullpen yet no move was made to shore it up. The Dodgers were unwilling to trade their top three prospects -- Joc Pederson, Corey Seager, Julio Urias and as it turns out others as well -- to add relief help to a team otherwise primed to make a World Series run. Via Marc Topkin at the Tampa Bay Times, "If Dodgers fire GM, they'd eye Rays Friedman." Friedman has earned an impressive reputation nationally in his nine years on the job, specifically in keeping the Rays competitive against significantly higher payrolled opponents such as the Yankees and Red Sox. Via Ken Rosenthal at FoxSports, "Puig's Game 4 benching for more than just plate struggles?" One play in Game 3, in particular, “generated a lot of commotion on the bench,” according to one source. Oddly enough, the sequence produced one of the Dodgers’ better defensive plays of the series, with shortstop Hanley Ramirez running into left-center field to catch a pop-up by Matt Adams for the final out of the third inning. Topps has teamed up with Bloomberg Sports to create "Players of the Game" limited edition card prints for each game of the playoffs so far. 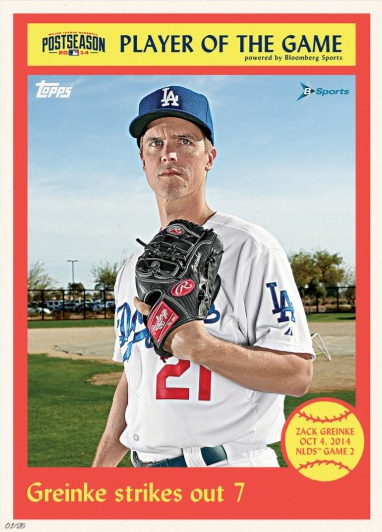 Our very own Zack Greinke is featured for his great performance on the mound during Game 2 of the Dodgers NLDS series against the Cardinals. Go here to check them out. The 10" x 14" print below (red borders) is limited to 25 copies and the blue bordered card on the right is a "1 of 1." I thought I should pass this along. 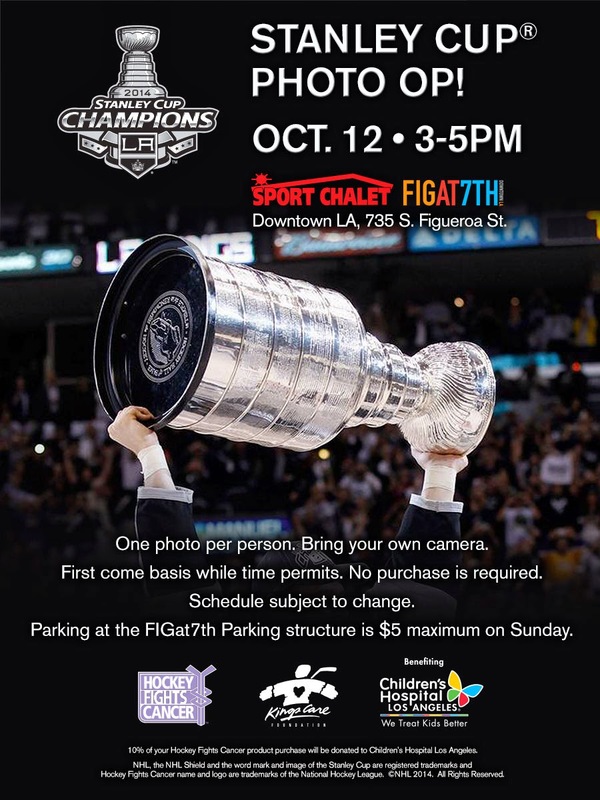 On Sunday (tomorrow) you can get your own photo with Lord Stanley's Cup. Go here for information, and check out the flyer below.